The Hungarian Paul Erdös was one of the greatest mathematicians of the twentieth century and one of the most prolific in history. This article describes the unusual itinerant life of Erdös, his idiosyncrasies, and his life’s mission to spot budding young mathematicians and encourage them. Erdös was inspired by Ramanujan’s work on prime numbers and arithmetical functions. 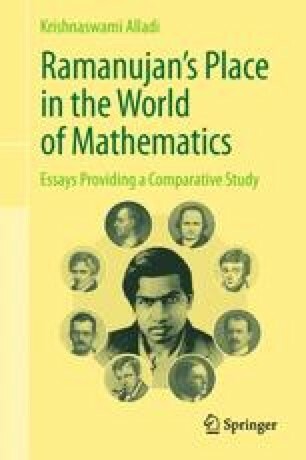 The origins of probabilistic number theory founded by Erdös and Marc Kac in the 1940s can be traced to the fundamental 1917 paper of Hardy and Ramanujan on round numbers and the remarkable story of how the Erdös–Kac collaboration came about is also told. This article appeared in The Hindu, India’s National Newspaper, in December 1996 for Ramanujan’s 109th birth anniversary.